McCormick Basil, Ground is the ground, dried leaves of the basil plant. 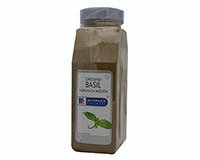 Use ground basil in sauces, soups, and seasoning blends where the fine powdered basil will blend with the other ingredients adding flavor without visible queues of the leaves showing. Native to India, basil is now grown commercially all over the Mediterranean region and in California. The dried basil leaves are grayish-green with an aroma and taste similar to cloves and anise. Basil blends well with tomatoes and is essential in most tomato-sauced Italian dishes. Ingredients: Ground Dehydrated Basil Leaves.